A: A Foreclosure is a property that a lending institution has taken back from a borrower who did not pay his mortgage. Q: How many bank’s Foreclosures do you list? A: The records are gathered from hundreds of lenders including banks, mortgage companies, holding companies, asset management companies and many others. Q: How long do listings stay on the Foreclosure site? A: Property listings remain on the site until they are sold. In some cases, properties remain on the site until the lender removes them. 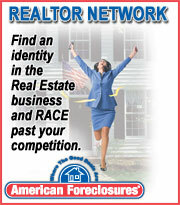 Q: How many Properties are on the Foreclosure site? A: There are hundreds of thousands. Listings are updated all day long. Q: How often do you update the Foreclosure list? A: We update our listings 24 hours a day 7 days a week. Q: What information can I see for each property? A: Property Type, County, City, Address, Zip Code, Price, Total Rooms, Bedrooms, Bathrooms, Lot Size, Taxes, Garage, Contact Name & Phone, Location, Area Map, plus Photo. Q: Sometimes I don’t see a picture in the listing. Why is that? A: Some listings are so new that the photo has not been supplied yet. Q: When I find a property I like, what’s my next step? A: Call or email the person listed who is handling the property for the lender. Make an appointment to see the property or make an offer. Q: Do I need all cash to buy a bank foreclosure? A: No, in most cases that won't be necessary. Although you'll need an earnest money deposit to accompany your signed contract, and a down payment toward the purchase, you can obtain financing for the balance. Q: Should I have a pre-qualification in place to buy a home? A: Yes! You should have a pre-qualification in place. If you are not pre-qualified, click here. Having all your financial information available will help the process move more quickly. If you do not have a pre-qualification, your offer may not be considered and you could lose the property to another buyer.